Summary: Deal or No Deal Slots is a fantastic TV-show slot game with fantastic payouts and features. Since it first aired in the Netherlands in 2000, Deal or No Deal has become one of the most popular game shows in the world. Although the format is straightforward, it’s a highly addictive game show to watch. When a contestant plays Deal or No Deal, they are presented with up to twenty-six numbered boxes or cases. One of the boxes or cases has the top amount available to win. The contestant chooses the box or case they believe contains the top amount and it is removed from play. The contestant then starts choosing boxes or cases and their amounts are revealed. As different amounts are eliminated from play, the game’s banker will make different offers to the contestant. With each offer from the banker, the contestant has to decide whether to choose Deal or No Deal. Deal means that they will take the banker’s offer, while No Deal means that they want to continue playing in pursuit of the game’s biggest prize. Because of the popularity of Deal or No Deal, the excitement of the televised game show has been captured in an online slots game. Deal or No Deal is a progressive online slots game. This means that the more it’s played, the higher the game’s jackpot rises. 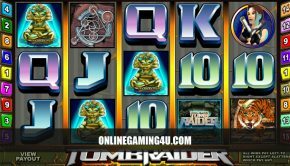 This online slots game features five reels and twenty paylines. You can play it with up to twenty coins at a time. The available coins to play with range between $0.05 and $0.20. If you want to get used to the game before you start playing with real money, you can take advantage of its free practice mode. 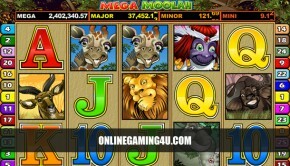 Because it is a web based online slots game, it can be instantly enjoyed without the need to download any software. Once you begin playing, you will notice that the game uses traditional slot machine symbols like cherries and watermelons. However, since this is Deal or No Deal online slots, it combines these traditional symbols with fun elements from the game show. One of the fun elements is the Deal or No Deal symbol. 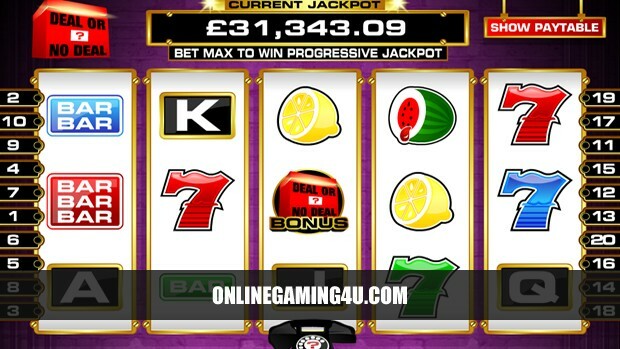 When you hit at least three of these symbols on an active payline, you will get to play the Deal or No Deal bonus game. When you activate this bonus game, you will get to be the contestant in your own version of a Deal or No Deal game. The other bonus game that is present in Deal or No Deal online slots is a bonus spin game. When you play this bonus game, the banker will interrupt your spin with an offer. You will get to decide whether to say Deal or No Deal to this offer. Once you make your decision, your spin will be completed so that you can see if you made the right call!